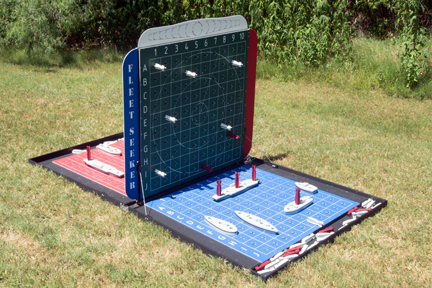 Rent Giant Fleet Seeker battle ship game for your MD DC VA party. Giant games bring new excitement to old board games. Giant Fleet Seeker Game- An oversized version of the classic board game enjoyed by both kids and adults. Giant Fleet Seeker involves competition, strategy, and excitement! Players play in a head-to-head battle, as they search for the enemy’s fleet of ships and try to destroy them one by one. A perfect game to add to any team building event, corporate picnic, fall festival, or other special event..
Includes game boards, 2 megaphones. Attenedant may be hired separately.